No more loose dentures! Combat normal gum shrinkage with Weber Dentrure Liners ORDER FOR TRIAL NOW! I am very pleased, can spit further than ever and eat chicken bones again! 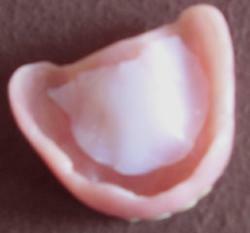 All loose dentures (false teeth) can now be salvaged and made much more comfortable. Instead of buying a very expensive replacement denture, use the Weber Denture Liner Kit to "fill the gaps." Now present dentures can be made to fit better with this new (Patent Pending) invention. 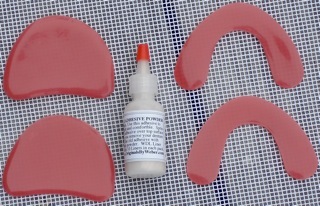 The Weber Denture Liner kit is now available in a "do-it-yourself-at-home" denture re-lining kit. Requires no mixing. These low cost Weber Denture Liners give new life to all loose, and otherwise uncomfortable dentures. The always-soft Liners automatically fill the space between the denture and the gums. They are always soft, and flexible at all temperatures. Liners can be easily molded and shaped with fingers to give dentures long lasting, near perfect fit. Use of Weber Denture Liners allows even old false teeth to be worn comfortably again, all day, with good support, increased stability, reliable retention and - no more denture caused sore spots or pain. Weber Denture Liner Kits are immediately availability in four handy do-it-yourself kits, The always soft Liner material in this kit is a flexible, translucent, putty-like compound designed to fill the gaps created by the slow but constant natural shrinkage of the gums and jawbones after natural teeth are removed. Now denture wearers can say goodbye to denture sores and mouth discomfort that is often cause by ill-fitting dentures. The Weber Denture Liner provides a denture wearer with the three basic essentials needed to have comfortable dentures such as: (1) support, (2) stability and (3) reliable retention. No mixing is required to use any of these new Weber Denture Liner Kits. After a few months of use most new denture wearers notice their once comfortable dentures (false teeth) lose their original stability. This happens because of slow shrinkage of gums and jawbones as a result of natural teeth being removed. This shrinkage can cause the rigid denture plate to become uncomfortably loose. When chewing food, the movement of the denture where it rubs against the gums can cause several raw and very painful sores to develop between the denture and the gums. Using this new, unique soft Weber Denture Liner can eliminate this very common sore mouth problem that many denture wearers have. Filling the "shrinkage gap" with Weber's new Liners is the best and most reliable way to provide a space-filling comfortable always-soft cushion between the hard acrylic plastic of the denture and the soft and tender flesh of the gums. The Weber Denture Liner kit is a low cost, do-it-yourself-at home method of re-lining all loose dentures old or new and also extend the old denture's useful life. It works with both: uppers and lowers. The soft, mold-able, always flexible Liner material self-adheres to the dry acrylic surface of the denture. The Liner can be easily cut with scissors and then shaped to fit the contours of the denture. Next, the Liner is simply placed on top of the denture using gentle finger pressure. The Liner retains its flexibility in all temperatures. 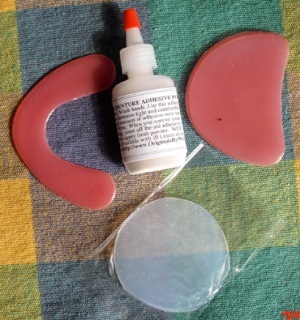 After a Liner is positioned on the denture, the user sparingly sprinkles the top surface of the Liner with the (included) denture adhesive powder. This powder provides increased denture retention where needed and gives added stability and support, thus eliminating annoying denture movement while talking and chewing food. HOW TO MAKE LINERS LAST LONGER: To extend the useful life of a Liner, it should be washed and rinsed with ordinary tap water once each day. At night, the Liner can be easily removed (peeled off) of the denture, rinsed clean, and re-used the next day. Liners can often be re-used many times (2-days, 7-days or even a month by some users). Liners are soft, flexible, shape-able discs approximately 2-inches in diameter by 1/8-inch thick. When Weber was asked what kind of feedback he gets from users of the Weber Denture Liner kit he said: "Let me quote a few of the comments I've had such as: (1) We LOVE this product! This is the answer we've been looking for! Thank you. (2) I am very pleased, can spit further than ever and eat chicken bones again! (3) Fantastic product, so easy to use! (4) Excellent product and highly recommended. (5) Really like it, works better than anything I have tried. (6) Nice product, great deal, thanks!" Weber Denture Liners are available in four kit sizes: (1) The Regular ( RK-4) kit contains: 4 round Liners, one bottle of denture adhesive powder and instructions. Price of Regular kit is $22.95 each plus $3.00 S/H. (2) The Trial kit (NKL-3) contains: 3 Liners:1- round, 1- upper, 1- lower, one bottle of denture adhesive powder and instructions. Price of the Trial kit NKL-3 is $16.95 plus $3.00 S/H. (3) Kit # PF-4 has 2 upper plus 2 lower liners plus adhesive powder. Price is $24.95 + s/h @ $3.00. KIt # PF -10, has 10 pre-shaped liners with 5 upper and 5 lowers. Price is $39.95 + s/h @ 3.00. Satisfaction is guaranteed or money back. To place an order or for more information, contact: Originals By Weber, 338 Alabama Avenue, Toms River, NJ 08753. Toll Free phone: 877-309-8382. A denture wearer can smile and laugh with no fear with Weber Denture Liners held securely in place in an open mouth. Can also: cough, sneeze and kiss normally. Trial Kit with all 3 shapes Weber Preformed Denture LinerTo use: place on your upper or lower denture and get immediate stability, comfort and confidence provided by a now secure (not loose) denture. Pre-Shaped Weber Denture Liner in your choice of Uppers or Lowers ORDER FOR TRIAL! Weber Plain Circular Denture Liner KitThese plain, circular denture liners can be custom shaped using fingers and/or scissors. Did you grandfather ever do this when you were a kid? Fun! No more loose dentures!You can have dentures that have good retention and are always: secure, stable, comfortable, at low cost. Weber Denture Liners require no mixing at all. Just drop in place.